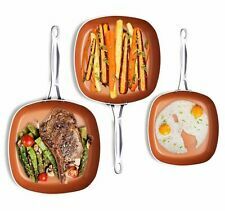 4.5 out of 5 stars - Gotham Steel 5 Piece Essential Cookware Set with Non Stick Copper Coating - NEW! 9 product ratings9 product ratings - Gotham Steel 5 Piece Essential Cookware Set with Non Stick Copper Coating - NEW! 4.5 out of 5 stars - Gotham Steel 10-Piece Complete Kitchen Nonstick Copper Pan & Cookware Set - NEW! 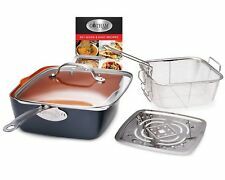 115 product ratings115 product ratings - Gotham Steel 10-Piece Complete Kitchen Nonstick Copper Pan & Cookware Set - NEW! 4.5 out of 5 stars - Gotham Steel Copper Crisper Tray - AIR FRY IN YOUR OVEN - As Seen on TV - NEW! 27 product ratings27 product ratings - Gotham Steel Copper Crisper Tray - AIR FRY IN YOUR OVEN - As Seen on TV - NEW! 4.5 out of 5 stars - Gotham Steel 11 inch Nonstick Ti-Cerama Copper Frying Pan - BRAND NEW! 15 product ratings15 product ratings - Gotham Steel 11 inch Nonstick Ti-Cerama Copper Frying Pan - BRAND NEW! LivingBasics® Pre-seasoned cast iron fry pan Frypan , 18 1/8" x 11 5/8" x 2"
Gotham Steel Titanium & Ceramic 10" Copper Nonstick Fry Pan - Gray, BRAND NEW! 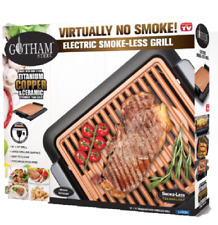 Gotham Steel Ceramic and Titanium Nonstick Double Grill - As Seen On TV- NEW! Norpro makes it easy to bring the popular Danish treat Aebleskiver into your home! Simply fill with fruit, jam, cream cheese, peanut butter, cheese, chocolate, or meats like sausage, ham or bacon. Top with syrup, jam, or powdered sugar. Whether you prefer sweet or savory, the possibilities are endless! The Aebleskiver Pan measures; 11 ½ inches in length (including the handle), 6 ½ inches in length (excluding the handle), 2 inches in diameter (individual hole), and ¾ inch in depth (individual hole). Hand wash only - packaging includes cleaning instructions. Recipes and instructions are included. Made in Taiwan. Ideal for braising and slow roasting or searing on stovetop, d7 ensures tender, flavorful results for all your unique cooking needs. Will have superficial scratch mark on Pan. Four layers of stainless steel retain heat for the ultimate in energy efficiency. As Seen on TV Gotham Steel 2" Deep Square Copper Frying Pan- BRAND NEW! Happycall Jumbo Pan. Super strong magnet lock, more secure. Total Length: 450mm. (Except for manufacturer's damaging case). Aluminum, Handle (ABS Resin). Solutions if exceeds. Faster heat and the heat evenly, because it has very high heat stress. New Listingnew Le Creuset Cast-Iron Oval Baker, Ocean, 1 1/2-Qt. Le Creuset Cast-Iron Oval baker from Williams Sonoma. This wide, shallow oval baker excels for oven recipes that call for a crisp topping, such as vegetable gratins, mac & cheese, scalloped potatoes and fruit cobblers. The only cookware of its kind, it features a patented technology of five alternating layers of responsive aluminum and durable heat-diffusing stainless steel. d5 stainless-steel cookware heats slowly and evenly. Colour: Red. Due to the quality differentiation between different monitors, the picture may not reflect the actual colour of the item. • Cooking glass ceramic. Add to favourites. The item is your responsibility until it reaches us. Gotham Steel Ceramic Non-Stick Griddle 10.5" - Brand New - Free Shipping! 14" Mandarin wok is made of 18-gauge cold-forged steel and is designed to resist cracking at its 6" steel handle connection. This style of wok is popular with Thai restaurants. Handle Size: 6". We will work with you to resolve any problem you may have. Flexible silicone cooking tool,perfect for poaching eggs,baking and moulding floats in water during cooking,poach it, bake it or mould it, this is one very handy tool to have in your kitchen. Note: Due to the difference between different monitors, the picture may not reflect the actual color of the item. Flexible cooking tool,perfect for poaching eggs,baking and moulding floats in water during cooking,poach it, bake it or mould it, this is one very handy tool to have in your kitchen. 4、separate the eggs edge with the mould with a toothpick,easily take the eggs out. Top Handle for Rena Ware Lid with ventilation. Screw is included. Part # 1727. GOTHAM STEEL 10.5-Inch Non-Stick Grill Pan With Ti-Cerama Surface, Copper - New! Lodge 9" seasoned cast iron mini wok features a flat base and dual handles for a safe, secure grip when transporting. The Lodge cast iron mini wok retains heat well, making short work for any dish. Cast iron is unparalleled in heat retention and even heating. Poignée Bouton de Serrage pour couvercle de cocotte Minute avec vis de fixation. Compatible a tous les modèles de cocote minute. Livré avec vis de fixation. HexClad 7 Piece Hybrid Stainless/Nonstick inside and out cookware Store Display. Wok: Woks are large, bowl-shaped cookware designed to pool small amounts of oil in the centre and work with minimal heat. The centre of the wok is designed to be the hottest, with the outside edges used to keep things warm as you heat the rest of the dish in the centre.